Li Sao, a famous poem attributed to Qu Yuan (340?-278 BCE),2 is also the title of what was one of the most popular qin pieces, found in 39 handbooks through 1946.3 With 18 sections (sometimes more), it is the longest Shen Qi Mi Pu piece to have been so commonly played. The variety of related forms in which it appears emphasizes its prevalence. None of the versions tries to set its words to music, but a number of them have lyrics with references to the poem, and the titles in the Shen Qi Mi Pu version refer in order to lines of the poem. Early Tang sources list titles such as Qu Yuan Tan (Sigh of Qu Yuan 19), then in late Tang the qin player Chen Kangshi created a Li Sao, Nine Sections,20 based on the original poem. However, the ancient transmission of Li Sao is not sufficiently documented to indicate whether either of the two versions to which Zhu Quan refers is melodically related to Chen's creation. There are recordings of Shen Qi Mi Pu's Li Sao by Guan Pinghu and Wu Wenguang. Mei Yueqiang has recorded the Ziyuantang Qinpu version, and Liang Mingyue has recorded his own composition on this theme. there are two qin melodies called Li Sao, one of 18 sections written by Qu Yuan himself, and one of 11 sections written by later people in memory of (Qu Yuan). 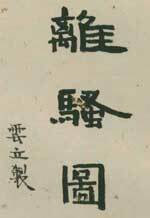 The Li Sao Jing23 says, Qu Yuan's original given name was Ping. He had the same family name as that of the Chu ruling family, and he served under King Huai of Chu as the Sanlu Dafu, whose duty was to manage the affairs of the Sanlu -- the three (Chu) royal clans, Zhao, Qu and Jing. Qu Yuan organized the records of its members, supervising the good and virtuous ones, so as to set a good example for all national officials. When he entered (the palace) he would examine and discuss policy with the king, and make decisions; when he went out he would inspect the lower rank officials, deal with the nobles, and carry out policies; the king valued Qu as if he were a close relative. Later he was slandered, and the king distanced himself from Qu Yuan, their intimacy declining daily. Qu, troubled and confused, didn't know who was accusing him, so he wrote Li Sao. For the olden days he portrays the rule of the three emperors Tang (Yao), Yu (Shun) (and Xia Yu); for latter days he portrays the disorders of Jie (last ruler of the Xia), Zhou (last ruler of the Shang), (Lord) Yi and (Strongman) Jiao.24 Qu hoped his sovereign would realize the truth and return to the Correct Way and they could be together again. At this time the state of Qin sent (their advisor) Zhang Yi on a treacherous mission to trap (King Huai) into having a meeting at Wu Guan. Qu Yuan advised the king not to go, but he didn't listen and set off. As a result he was coerced into submission and died while captive in Qin, (his son) King Xiang coming to power. Again slanderous words were used and Qu Yuan was transferred to Jiangnan. Qu Yuan also wrote Jiu Ge, Tian Wen, Yuan You, Yu Fu25 and other such poems, hoping thus to make know his ideals in order to enlighten his sovereign; but in the end he was not understood. He could not bear seeing his own country fall into a dangerous collapse, so he expanded this onto the qin in order to make his pronouncements to heaven and earth. Qinding Buhui Xiao Yuncong Li Sao Quantu 欽定補繪蕭雲從離騷全圖 , reprinted in Siku Quanshu. Details in a footnote under Scenes illustrating melodies from the Chu Ci. 73349.1 (radical 虍 hu, phonetic 必 bi so some say "Mi Fei"; also 宓妃 Fu Fei). She is said to have been 伏羲之女 a daughter of Fuxi (see Hawkes, p.90), but as the 落神 Luo River Deity she seems also to be have been associated with 甄洛 Zhen Luo, a wife or concubine of 曹丕 Cao Pi (187 - 226). Her Wikipedia entry has some further detail on this. The original text of the preface and section titles are here. Cf. Hawkes, p.88 concerning 羿 Yi (line 149) and 澆 Jiao (line 153). Yi, said to have been a descendent of the famous archer Hou Yi, usurped power from Xiang, a descendent (son?) of Qi, the founder of the Xia dynasty; Yi was in turn murdered by his wife in league with Han Zhuo. Jiao, a son of Han Zhuo, apparently took part, but was later killed in revenge by a son of the murdered ruler. Timings follow my CD; the original Chinese section titles are here. (1692; fac/) Identical to 1647? Uses many section titles from 1491 etc. (>1802; XIX/178) 16; "= 1689"